None of the discussion questions have anything to do with what the Scripture is actually talking about, but instead brings the discussion back to Adventist distinctive teaching and introduce speculation. Luke 9:28-36: In the Transfiguration, Moses and Elijah faded away after God the Father said to listen to His Son, and Jesus was left alone. Who could possibly be sent after Jesus? Hebrews 1:1-4: God spoke by prophets, but in these last days He spoke by His Son, the exact representation of His nature. Who can possibly speak after His Son? Ephesians 3:4-6: the Gospel was more fully revealed to the apostles (that it is for the Gentiles also). What can possibly be more complete light than the Gospel? 2 Corinthians 3: The New Covenant (ministry of the Holy Spirit) surpassed the Old Covenant (ministry of death in letters engraved on stones) and it doesn’t fade. What more is needed than the indwelling Holy Spirit? Hebrews 8:7-13: The New Covenant replaced the Old Covenant (which had fault). Is there fault with the New Covenant and any need for a change after it? Galatians 1:8,9: If anyone preaches a Gospel contrary to the Gospel revealed in the Bible, he is to be accursed. The New Testament believers didn’t have “testing truths” – they only had to believe in Jesus’ finished work on the cross. Changing, adding to or contradicting this basic, fundamental truth of the Gospel is deserving of a curse and not acceptable. The “new light” that the SDA church proclaims (Sabbath-keeping as an end-time test, requiring evidence of sins overcome in order to pass the investigative judgment, and a health message that is considered “the right arm of the Gospel” when Romans 14:17 says the kingdom of God is not eating and drinking but peace and joy in the Holy Spirit) is indeed another Gospel. The next discussion question asks how to deal with complaining church members. The instructions in Thessalonians say nothing about complaining or expressing concerns over real problems and therefore that topic does not belong in the discussion questions. It talks about living an unruly, undisciplined life, busybodies, and not working, but it doesn’t discuss complainers or expressing concerns. 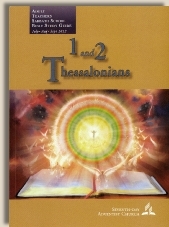 If this lesson is a Bible study on what 2 Thessalonians teaches, it makes no sense to bring in topics that are not addressed. This week’s lesson has clearly revealed in case after case, how SDA’s show little respect for God’s Word, treating commands as suggestions, giving Scripture writing no more authority than other words or actions, and repeatedly describing Scripture as men’s words inspired by God rather than God-breathed. Also, in typical fashion, the lesson used every opportunity to reinforce the specialness of SDA’s unique teachings, almost as if that’s what is meant to be taken from the Bible lesson.